It is difficult to say what the journalist felt back then, but when he recalled this episode in the early 1980s in his memories, his disdain was palpable. 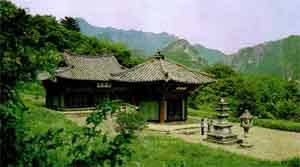 But this is indeed what happened to many - indeed, most - Buddhist temples in North Korea. For decades, the North Korean state was almost unique in its hostility to all forms of religion. Indeed, few if any Communist states ever came close to proclaiming and enforcing a complete ban on all kinds of religious activity - aside from North Korea, such a ban existed only in Albania, another ultra-Stalinist state (Pol Pot introduced the same policy in his infamous “Democratic Kampuchea,” but he did not stay in power long enough). Its leaders and activists were prominent in two major outbreaks of the nationalist movement - the Tonghak Uprising of the 1890s and the March First Movement of 1919, and this tradition made the North Korean authorities somewhat more tolerant towards it. Buddhism fell somewhere between. It could not boast the nationalist credentials of Chondogyo - on the contrary, in the colonial era many Buddhists collaborated with the Japanese (as a matter of fact, some colonial administrators saw Buddhism as the “religion of empire” and actively promoted it). At the same time, it did not have Christianity’s close associations with “imperialist” powers.